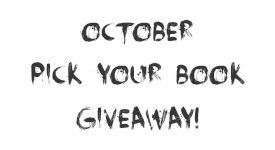 The winner can choose any ONE book, up to $15 value, as long as it is released during the month of October, 2017. Thank you for this opportunity. I can't wait to get my hands on "All the Crooked Saints" by Maggie Stiefvater. I am looking forward to the new John Green book! Ooh yay giveaway! There are some indie books coming out that I am so excited for. Satellite also looks good. Thanks for the chance to win! So many books I'd love this month - Turtles All the Way Down, Anna Fariss' memoir, etc. etc. THE RULES OF MAGIC is on my list. by Julie C. Dao and The Afterlife of Holly Chase by Cynthia Hand. HUmm... Emperor of the evening stars by Laura Thalassa =) ! Hideaway by Penelope Douglas ! All the Crooked Saints by Maggie Stiefvater, etc ... So many great books this month =) ! I LOVE THE SPOOKY DESIGN!!! Probably All the Crooked Saints, because I'm excited to see what Maggie Stiefvater does with that story as I don't know what to expect at all! I am looking forward to Darynda Jones 12th book in the series!! Oooh, I would love That Inevitable Victorian Thing <3 Thank you for the chance! The Memory Trees by Kali Wallace. I read and loved her debut book Shallow Graves (to be reviewed...).